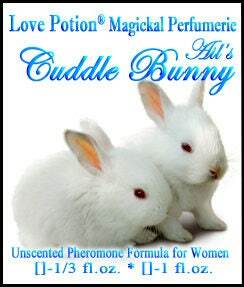 A pheromone blend for cuddling...and what that inevitably leads to! Ingredients are known to inspire nurturing protective feelings. Creates an air of vulnerability, is ultra feminizing. Can inspire men to behave chivalrously, and encourages cuddling. Can be a serious turn-on for men. Makes wearer feel adored, inspires others to be cherishing, helpful, solicitous. Many men find it calming and soothing too.